It's not just an app! It's a Practice Management Solution! Because it's easy to use. Because you can take it with you. Because it doesn't look like all the other boring Clinical Notes Software. Because epiPRACT has now turned your iPad into serious a business tool! epiPRAC by Epidexia is a complementary, alternative or allied health practice software solution that will let you book appointments, keep track of client records, and generate invoices (printed and/or eMailed) out of a single application on your iPad or iPad mini. In addition there are functions to send appointment reminders via eMail or SMS, eMail exercise or diet plans, produce financial and tax reports for your practice and help you identify your most valuable clients. Client/Customer: Manage Client Details, View Client Medical History, Scroll through Clinical Notes. Clinical Notes: View and update by Client, Diagnostics, Send reminders. Calendar: Add new appointments, View existing appointments (Day, Week, Month views), Enter/Update Clinical Notes. Billing: Create new Tax Invoices, Review outstanding Invoices, Track Payments, Print or eMail Invoices. Reporting: Run Financial and Client Reports, Print, email or PDF reports. epiPRAC will suit practitioners in Acupuncture, Aromatherapy, Chinese Herbal Medicine, Chiropractic, Osteopathy, Counselling, Homoeopathy, Myotherapy, Musculoskeletal Therapy, Naturopathy, Nutrition, Oriental Remedial Therapy, Remedial Massage Therapy, Shiatsu, Traditional Chinese Medicine, Western Herbal Medicine. It is also suitable for Physiotherapists, Personal Trainers, Dentists, Dieticians, Nurses, Care Providers, Psychologists, Dermatologists, Life Coaches, Gastroenterologists, Iridologists, and Vets to name a few! Portability: Improve your work/life balance because you can take your practice with you wherever you go. Simplicity: Simplify your life. The iPad was designed to be light and portable. Now you can run your practice from any location without the burden of lugging around a heavy laptop. Savings: Save money on printing paper and ink cartridges when you email tax invoices to your clients. Save accountancy fees with financial and GST reports right out of the box. 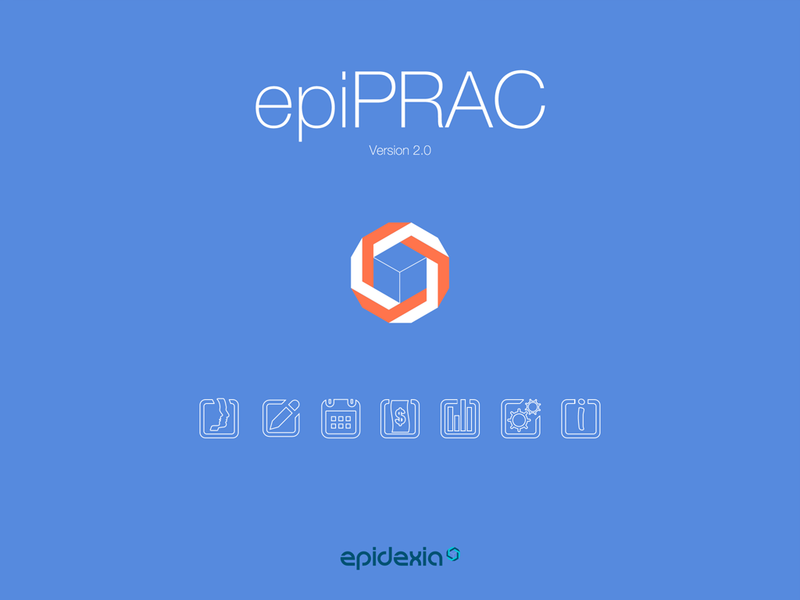 epiPRAC is designed to run on the iPad or iPad mini so it will only available soon on the Apple App Store. The name epiPRAC is made up of two parts; 'epi' from the first three letters of our brand/business name 'Epidexia' and 'PRAC' for Practice or Practitioner. Easy to say, easy to remember! Look out for more epi apps coming soon!